First of all, you don’t need to be a chef to benefit from today’s article. I’ll answer a common question so when your client asks, you’ll be able to give them the best information possible. 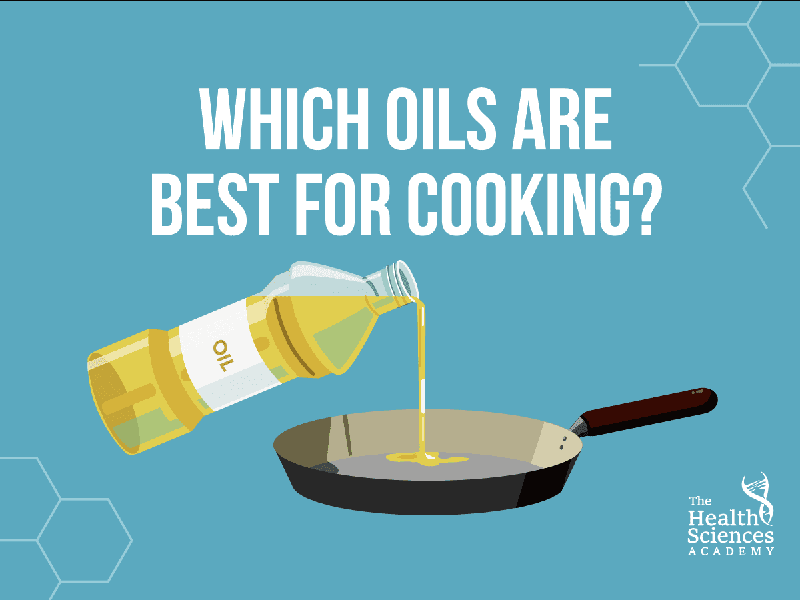 Which oils are you (or your client) cooking with? Why are you (or your client) using those oils? Do you think there are better options? And which oils do you believe you should avoid? With that in mind, the context of today’s article is the toxicity, oxidation, release of free radicals, and degradation of oils for cooking (rather than heart health, or weight loss, or everything else under the sun). they reuse the oil over many times. Keep in mind that our human body is quite capable of defending itself from toxic or unsafe compounds that enter its space. The best line of defence that you can consciously choose for your well being is to minimise exposure to noxious compounds such as these. Higher heat cooking is used for sautéing, frying, stir-frying, grilling, pan roasting, searing and caramelising. As mentioned previously, you can use oils with stable fats, such as olive oil, avocado oil, clarified butter (ghee), refined palm oil, and coconut oil. This is a healthier way to heat your foods, because oils with saturated fats are pretty resistant to heating, which means less degradation. Based on the above, here are the best cooking oils to use in the kitchen in order to reduce free radical exposure and toxicity. Click HERE to get our Oils For Cooking Workbook™ (PDF download) that will help you work out if the oils you're currently using are suitable or not. HIGH smoke point (160 °C or above). Store your oils in a cool, dry place, away from direct light. You don't want them to oxidise and go rancid. Also avoid buying in large containers. Buy smaller batches, so the oil has less 'sitting around' time and stays fresher. Were you aware of this information regarding oils for cooking? What's been your experience? What have you or your client been using so far? How can that change? Hop in the conversation below and let us know. Share this with someone who could use a quick lesson! I have heard that Canola Oil is bad for you as an unstable fat. I have also heard that this was a rumour that was started and there is no truth in this. I have a flat belly diet cook book and Canola Oil is used frequently as a MUFA (monounsaturated fatty acid). Can anyone confirm categorically if this is a good or bad oil. Hi, great article thanks for sharing. I was of the understanding prior to reading this that Olive oil was not a good choice for really high heats? Could someone please clarify this for me. I personally tend to use Olive oil on my salads and Coconut oil for my high heat cooking, does anyone else do this? I don’t cook with olive oil especially not refined. Adding the word refined to any foods just like the sugars and carbs is not good. Your oils should always come in dark bottles & even a box if its top top quality. If you read the book fats that heal you will never bad mouth butter again. Recent studies (sorry I don’t have them in front of me) say that expeller pressed oils are not good because toxic chemicals are used to facilitate the process so the more unrefined and organic the product, the better in general for health. Canola is a rapeseed, isn’t it? Canola stands for Canadian Oil and I’m pretty sure rapeseed is GMO. If anyone knows that for sure, I’d love it! Also, no (refined or otherwise) palm oil is a good choice because Palms are being over-harvested and decimating critical habitat in places like Borneo, Sumatra. Nutritional choices seem to be more than just for personal health, but need to include global health and consequences. Natalie, I would always badmouth butter because it’s an animal product and I am vegan. I’m confused. I was told that olive oil would be best for sprinkling on cold food and not for cooking. I was using extra strength olive oil to cook all of my food and this nutritionist told me to use coconut oil instead or ghee. Where does rapeseed oil feature in the ratings? What do you think of lard as a fat for cooking with? I have some linseed oil which may well be rancid by now – is there any way of using this so that it is palatable? So how about cooking with virgin or extra virgin olive oil? Is that okay – apart from being an expensive option. What oils are best for baking? And What oils are recommended for salad dressings? Again that are the most heart healthy. Hi there. I thought that olive oil and avacado oils were unsaturated fats and that we were to avoid saturated fats such as the tropical oils. I’m sorry, I’ve read all the comments already. Oh dear! Gonna have to redo my research :0( Why have I got it firmly in my mind that Olive oil is best lightly heated and that rapeseed (canola) and sunflower are best for hard frying? Has opinion/the evidence-base changed? I usually put the Canola Oil in cakes and do not use it for frying. I also don’t use it so frequently but do use Olive Oil for frying and mixing with balsamic vinegar for dipping bread and Rapeseed Oil for baked potatoes. I will try Flax Oil for salads and see where I can get hold of some of these other oils that I haven’t seen before such as coconut and avocado (possibly because I’m not looking for them). I think if I use it in moderation and eat lots of broccoli :-) we should be OK.
Great article Alex. A lot of people are confused by this subject. I have been reading about oils for quite a while and switched over to virgin coconut oil years ago for its many benefits. I mostly use virgin olive oil in my salad dressing and I use butter if I am lightly scrambling an egg. I was also buying lard from the farmers market which (not bleached and refined as the store bought) I believe would be a good alternative for meat eaters to roast or fry with again in moderation. This article has reinforced advice given to me by a friend who recommended coconut oil as a healthier alternative to sunflower oil for cooking. I hate the smell of coconut but have to admit when using it to cook with, there has been no difference in taste. If you find coconut oil hard to find, try any major ethnic Asian, Caribbean or African store. It has multi-purpose usage in these cultures, for food, hair and skin. Karen, you can find it now in Tesco in the oils section – great stuff! Author of the coconut oil book, is Siegfried Gursche, MH A must have book! It has a wealth of information, miracle oil for heart disease, diabetes, cancer, healthy skin and hair, HIV/AIDS,cleanses liver, and more! A great read! Could you tell me where peanut oil falls in the charts? Also is there any alternatives to oils in frying? I know of a few in baking. We have been using coconut oil for all our frying,cooking and baking for years now. I use olive oil only for salad dressing. I use organic butter, as well, when I want that taste. Coconut oil that doesn’t taste like coconut enhances the flavor of food. It is super good for frying and popcorn made with it is soooo good. Coconut oil can also be used for candy and fudge with very little sugar. We don’t really like to go out to eat anymore because we know they use bad oils. I use coconut oil to wash my face and shave my legs and I don’t need a moisturizer or lotion. It is popular as a cooking oil in several Asian countries, including Japan, India and China. Paul, A.; Masih, D., Masih, J., Malik, P. (2012). “COMPARATIVE ANALYSIS OF HEAT DEGRADATION OF ORYZANOL IN RICE BRAN OIL, MUSTARD OIL AND SUNFLOWER OIL BY MICROWAVE AND PAN HEATING”. International Journal of Food and Nutritional Sciences 1 (1): 110–117. Retrieved December 2012. Thank you all for the information about cooking oils, where does vegetable oil come into all this, as I thought it was good for cooking. I have learnt a lot about olive oil, I now use it for my salads and I have just started using coconut oil and I just love it as it seems to be good for everything. Thank you for the link about the oils. What about extra virgin cold pressed rapeseed oil? I have used that for roasting as it has a high smoking point and contains omega 3, 6 a and 9, but now I’m wondering whether I’d be better off using something else? Hi Tanja! If you use rapeseed oil for high-heat cooking, make sure to follow the steps in the workbook to assess suitability. The workbook will also help you to shortlist a few alternatives, which is always handy. Our goal is for you to do the work and to learn exactly how to do this on your own by following the steps, that way you can make your own decisions but in an informed manner. Once you have your shortlist of alternatives, you may want to create a comparison chart (on paper or a spreadsheet) with their individual properties and nutritional values to further narrow things down. Have fun with the process and detective work! By the way I love your website and am thoroughly enjoying the course I am currently enrolled in. Thank you for providing a wealth of information! Canola oil, or rapeseed oil as we call it in the UK, is not one third polyunsaturated fat, it’s around a quarter. Reading directly from the back of Mazola pure rapseed oil, it states 25.1 grams per 100 of polyunsaturated fat. I agree with the article. There is an Internet based myth that rapeseed oil is bad for you. It’s packed with Omega-3 and helps the Omega-3 to Omega-6 balance. Given that, it’s far better than sunflower oil, which is the real problem, being massively high in polyunsaturated fat. Thank you for the insight into oils, I now know which oils to use for the appropriate method of cooking, and I hope to be substituting the sunflower and vegetable oil in my next food shop! Really interesting article :-) Thank you! In my cupboard I have Biona’s organic coconut oil CUISINE – mild and odourless and states can be used for baking, frying and roasting as well as organic extra virgin coconut oil cold pressed. Is one better than the other? The information on “Cooking Oils” was informative; however, should these oils be used in baking as well? I have mostly used Canola Oil for baking, and just recently started using Coconut Oil. I assume the measurements would be the same for liquid versus solid oils, is that correct? Thank you! A very useful article, thank you. I’m one of the few people who is sensitive to coconut oil (muscle and joint pain increases and my energy levels plummet), and there’s dairy intolerance in my family, and I get muscle weakness with butter, so I’m guessing that refined olive oil is my option unless you suggest anything else? Thank you for the article and easy understandable explanation. I am mostly using Olive oil for cooking, but I always buy the extra virgin one, usually not so expensive one, so not really sure about the quality. My concern is, how can I recognise a refined olive oil (without the combustible solids)? Can I find it written anywhere on the bottle? Thank you so much! Hi I have read through the article on oils and the oils workbook but can’t see Rapeseed oil. Is it ok to cook with? Also I’ve heard that coconut oil is bad for you due to saturated fats but also heard it’s good for you as they are a good type of saturated oil could you clarify please? Joanne – Have a look at the table in our Oils for Cooking Workbook™ PDF download, where you can find the percentage of polyunsaturated fats and the smoke point of rapeseed oil. Remember, you should be looking for 2 features to lower the amount of harmful oxidants from high-heat cooking: 1) a LOW percentage of polyunsaturated fats plus 2) a HIGH smoke point. You can definitely make your meals more palatable by adding fresh rapeseed oil to a finished dish (after being cooked with a less oxidising oil). – Why is Harvard sticking the knife into butter again? – Saturated fat promotes metabolic disorders? A great article which was easyly understandable. Just a quick question about cooking with Rapeseed oil? It has been said that rapeseed oil is a good cooking oil. Is this true? Hi all. Am I right in thinking that coconut oil does not putrify? I can’t remember where I saw this but definitely saw it. Apparently there is something (can’t remember what now) not in coconut oil that allows it to stay fresh. I only use coconut oil to cook with these days because I love the flavour it adds to any food, spicy or not. I even add it to porridge for breakfast. Lovely! Thanks for the great articles. Keep ’em coming. Hi! Thanks for the article. I find it very interesting. I would like to know if you could share the bibliography and studies from which you obtained this information. I´m a nutritionist and some times I have a hard time with some doctors introducing this perspectives. Genotoxic and carcinogenic risks associated with the consumption of repeatedly boiled sunflower oil. Genotoxicity and oxidative stress of the mutagenic compounds formed in fumes of heated soybean oil, sunflower oil and lard. Lipid peroxidation of membrane phospholipids generates hydroxy-alkenals and oxidized phospholipids active in physiological and/or pathological conditions. 4-oxo-2-hexenal, a mutagen formed by omega-3 fat peroxidation, causes DNA adduct formation in mouse organs. Mutagenicity and identification of mutagenic compounds of fumes obtained from heating peanut oil. In vivo absorption, metabolism, and urinary excretion of alpha,beta-unsaturated aldehydes in experimental animals. Relevance to the development of cardiovascular diseases by the dietary ingestion of thermally stressed polyunsaturate-rich culinary oils. Effect of heating/reheating of fats/oils, as used by Asian Indians, on trans fatty acid formation. Formation of trans fatty acids during the frying of chicken fillet in corn oil. A study on genotoxicity of cooking fumes from rapeseed oil. Mutagens from heated Chinese and U.S. cooking oils. Chemistry of deep-fat frying oils. Regulating the use of degraded oil/fat in deep-fat/oil food frying. Virgin coconut oil is best for cooking. Clarified butter-Ghee made from grass-fed butter has some interesting health benefits. I’m assuming it isn’t something we should be putting on skin? Your article regarding cooking oil is really a good one.But can you tell how about the cottonseed oil and soyabean oil. Is it good for cooking?. Hi Jason! Have you downloaded the workbook inside this article yet? Both oils are mentioned in it, together with the steps to categorise them.